The Chevrolet Chevelle Laguna is a mid-sized automobile produced by the Chevrolet division of General Motors for the 1973 through 1976 model years. 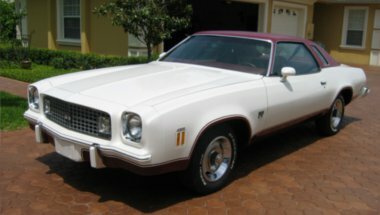 Part of the GM A-Body platform, the 1973 Laguna series included coupes, sedans and station wagons. It was the top-line Chevelle series that year positioned above the Malibu. 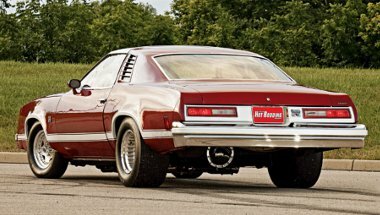 For 1974 through 1976 the car was produced as a one-model Laguna S-3 Coupe, the new-for-1974 Malibu Classic series taking the top-luxury series position. All Lagunas sported urethane front-ends which easily distinguished them from other Chevelles. NASCAR driver Cale Yarborough earned the first two of three consecutive Winston Cup Championships piloting a Chevelle Laguna. Conceived in optimism but born late, the 1973-1976 Chevelle Lagunas accounted for 108,815 of nearly 1.7 million third generation Chevelle sales. When these Chevrolet intermediates were retired it had to be obvious to anyone who bothered to notice that there would never be cars quite like them again. Surprisingly large and comfortable, surviving Lagunas bring back memories of how enjoyable V-8-powered, rear-drive 1970s GM cars could be. That is, if you can find a nice one today. Pristine examples of the 42,941 1973 Laguna Coupes, and 38,790 1974-1976 Laguna Type S-3 Coupes are difficult to find which is a shame, now that fuel is plentiful and the 55-mph national speed limit has been consigned to history. Chevrolet honored California beach resorts once again by naming the top 1973 Chevelle series Laguna with the Malibu taking the middle spot while the base series was called simply Deluxe. Laguna models featured specific front and rear styling including a body-colored urethane front end concealing the new 5 mph bumper system. On minor impact the urethane nose cone, backed up by shock- absorbing cylinders, deflects and rebounds; Laguna models also featured a specific diecast chrome car grille with bowtie emblem, a body-colored (steel) rear bumper, front and rear bumper rub strips, bright roof drip moldings, bright wheel opening moldings, chrome taillight bezels, full wheel covers, and Laguna fender nameplates. Laguna interiors were more lavish than the Malibu in pattern cloth and vinyl or optional breathable all-vinyl upholstery, distinctive door trim with map pockets, deep-twist carpeting, woodgrain vinyl accents, and Laguna nameplates. The 1973 Chevelle Laguna "Colonnade Hardtop" featured a semi-fastback roofline with styled "B" pillars, frameless door glass and distinctive rear quarter glass on 2-door coupes. New side windows with styled center pillars were featured on 4-door sedan models. The new design "B" pillars were structurally strong enough to contribute to occupent safety of a roll-over type accident. GM had anticipated Federal roll-over safety standards for January 1974 that ironically didn't materialize. The unusually thin windshield pillars contributed to the much improved visibility over the previous generation Chevelles. Two Laguna station wagons were introduced, including a Laguna Estate. The wagons, available in 6 or 9 passenger seating, featured a counterbalanced liftgate which allowed for easy entry and loading up to 85 cubic feet. The 1975 Laguna S-3 was introduced mid-year in January 1975. This time, it wore a rakishly slanted, urethane-covered aero-style nose designed for NASCAR and louvered opera windows. The Colonnade designation was dropped. 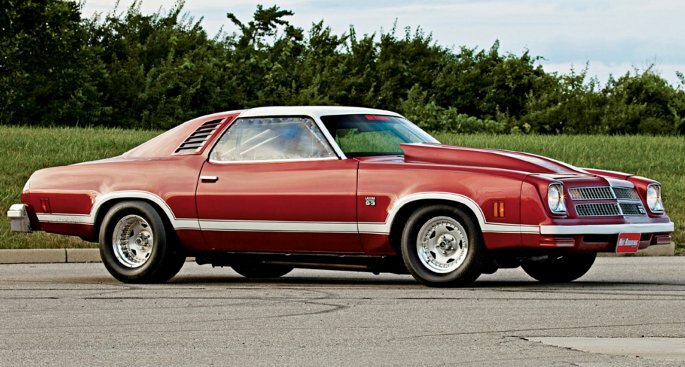 The vinyl half-roof, swiveling Strato-bucket front seats with center console, as well as the four-spoke sport steering were no longer standard S-3 equipment, and were made optional in mid-74 to reduce the car's base price. The 454 engine option was available for the first half of the model year after which the 400 engine became the top engine. The 49-states engine line-up was - the standard 145-horsepower 350 two-barrel V8, the optional 180-horsepower 400 four-barrel V8, and the 215-horsepower 454 four-barrel V8. In California, a 155-horsepower 350 four-barrel V8 was standard and the 180-horsepower 400 four-barrel V8 was the only engine option. All 1975 models included the newly introduced catalytic converter. The Turbo Hydra-matic 3-speed automatic was the only transmission offered as manual transmissions were discontinued. Options included an Econominder gauge package, affirming again that the age of muscle cars was long gone. The 1975 Laguna S-3 was introduced mid-year in January 1975. This time, it wore a rakishly slanted, urethane-covered aero-style nose designed for NASCAR and louvered opera windows. The Colonnade designation was dropped. The vinyl half-roof, swiveling Strato-bucket front seats with center console, as well as the four-spoke sport steering wheel were no longer standard S-3 equipment, and were made optional in mid-74 to reduce the car's base price. The 454 engine option was available for the first half of the model year after which the 400 engine became the top engine. The 49-states engine line-up was - the standard 145-horsepower 350 two-barrel V8, the optional 180-horsepower 400 four-barrel V8, and the 215-horsepower 454 four-barrel V8.